When your pet gets lost it is a nerve racking experience. In fact, statistics show that up to 8 million animals end up in shelters each year of which only 15-20% of dogs and 2% of cats are reunited with their owners. One way to increase the chances of being reunited with your beloved pet is to get them a microchip. A microchip is a small device that is injected under the animals’ skin between the shoulder blades. E ach microchip has a unique number that is entered into a database. This number coincides with your pet and can be picked up by a scanner used at the local shelters. A microchip can be given to dogs, cats, ferrets, horses and most other mammals. 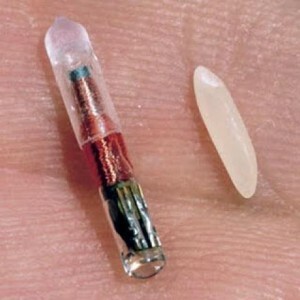 Microchips are implanted with a needle and can be administered during a routine visit. It doesn’t hurt the animal anymore than getting your blood drawn. It is important to have a professional (like your veterinarian) inject the microchip to ensure sterility and proper application to avoid the infection or death to the animal. Microchips cost around $50 but they are well worth the investment. Here is the major reason why microchips are so important: no matter where the animal ends up if the shelter scans the animal for a microchip they can then access the database and contact you. Shelters have a tendency to be overrun and scanning animals upon arrival has become standard procedure. Shelters can save more animal lives with the aid of microchips. Lastly, it is important to understand that a microchip is only one way to identify your pet. Your local municipalities will still require that you tag and identify your pet through them. Think of this as another safeguard in protecting your animal. Remember to keep all your pets information up to date. Keep your pets close. Go to your veterinarian and get a microchip for your furry companion. Here’s to Chip your Pet Month hope it is PAW-some!